You can simultaneously edit multiple worksteps of the same type. 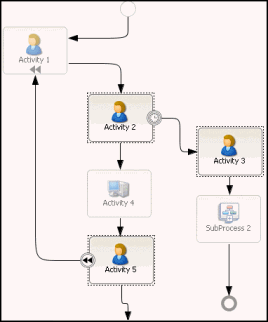 For example, you can select all Activity worksteps in a process template and assign the same performer to all, or change the Priority of all Adapter worksteps at the same time. 1. Click the Select ( ) icon in the palette and drag the worksteps to be selected. Alternatively, you can press CTRL and then click the worksteps to be selected. The Properties view displays the name as “(multiple worksteps)” in a read-only box. 2. Modify properties such as the performer, priority, and duration, as required. For instance, change the priority to Critical.